Relax in our peaceful Dorset country retreat near the coast. Our lovely guest house comfortably sleeps 2, with a separate bedroom and bathroom. The light, spacious living space with well-stocked kitchenette opens onto a secluded, sunny garden. We are in a small village in the beautiful Marshwood Vale, surrounded by green fields and only a 15 minute drive from the coast. Perfect for walking holidays, exploring the Jurassic Coast or simply getting away from it all. The Old Cider House is a private, separate annex next to our house, set in a south facing garden. The lovely, light living space includes a well stocked kitchenette and french doors leading to the sunny garden. You have a separate bedroom with double bed and dresser, as well as a modern bathroom with shower. There is plenty of parking and you have your own separate entrance and garden space. The kitchenette includes a microwave and electric induction hob, plus enough pots pans, utensils and other kitchen stuff to whip up a decent meal. There is also a small table to pull out so you can sit and eat in comfort. French doors lead up a couple of steps into the garden where you have a private seating space to enjoy meals outdoors and well deserved sundowners. When you arrive, you will find all linens and towels provided. We do ask that you keep our towels for indoor use and please bring your own beach towels. Other little extras provided, which may make packing a little easier, include a hairdryer and complimentary toiletries. You will also find some basics in the kitchen including salt, pepper, cooking oil, sugar and tea bags. A Nespresso machine is provided with a small number of capsules to start you off. You may also find some home-baked goodies waiting for you on arrival! The annex is a completely separate building within our garden, with its own entrance from the road and secluded garden space facing away from the main house. We have a vegetable garden which you are welcome to take advantage of if anything is ripe & ready, as well as your own small herb patch to help the self-catering menus along. Our family have lived in Dorset for over 10 years now and love this area. We enjoy spending long days at the beach and walking our Jack Russell, 'Chip', through the beautiful surrounding countryside. We've always loved Dorset and longed to live near the sea, so living here is a long held dream for us! The area is simply lovely: beautiful countryside bordered by a stunning coastline, great places to eat and drink, peaceful surroundings and, to top it all, friendly people. It's great to be able to share all of these things about our home with our guests. All bathroom towels, bed linen and tea towels are provided, but please bring your own beach towels. We can't fit a car in, but you are welcome to put bikes etc in there if you wish. We provide bath towels but, please note, these are not for use on the beach or outside. A lovely, light, airy space with comfortable sofa, TV, radio, magazines, books and games to relax with. Nespresso machine and small number of capsules provided. You can buy more from me or you'll find all supermarkets now sell compatible pods. A small amount of basics provided: salt, pepper, teabags, sugar and cooking oil. These are complimentary so please do help yourself but you will need to buy extra if you run out. Everything you will need: plates bowls etc plus microwave safe containers, pans and tupperware to store food. Sharp knives (not blunt!) and proper wine glasses too! Well stocked kitchenette: all crockery, cutlery & utensils provided plus salt, pepper, teabags, oil, washing up liquid. Nespresso machine, toaster, kettle, microwave and induction hob (no oven). Small gate-leg table and chairs provides comfortable seating for dining. A small selection of books and magazines are available. A selection of games including backgammon is provided for your enjoyment. A lovely, secluded area of the south facing garden with herb patch and table and chairs for your use. You have your own secluded section of the garden, facing away from the main house, with a table and chairs on a small patio. This is by the vegetable garden including a herb patch for you to use. 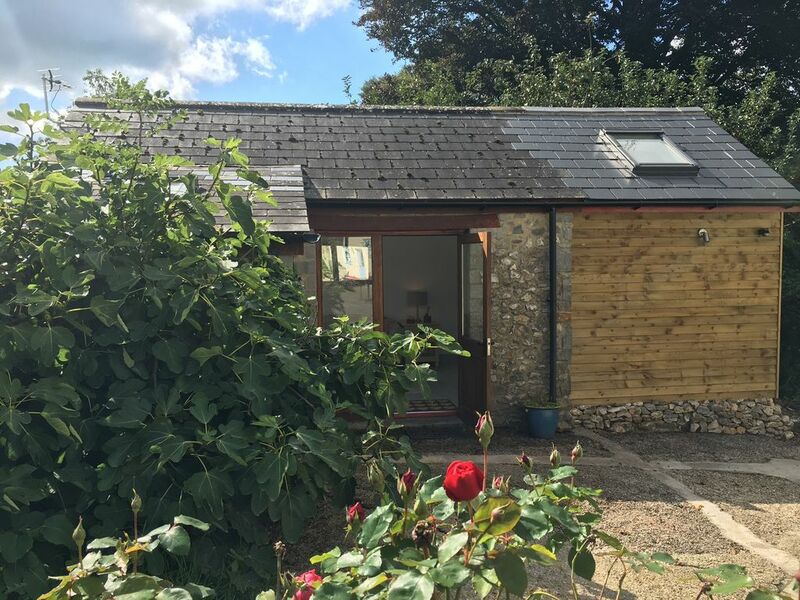 Our annex is very cosy and perfect for a quiet getaway, walking, sightseeing and exploring the Jurassic Coast. We've tried to think of everything to make your stay truly memorable. We're always happy to help, so please do just ask! We stayed here as we were invited to a nearby wedding. It was a lovely little retreat, and was very clean. Marianna was a great host. Even though it is very rural, it’s not difficult to get to nearby places of interest. Plus the bed is ridiculously comfy! We thoroughly enjoyed our stay. Cosy warm and clean accommodation away from it all with all the facilities needed. We stayed for two nights to get away from our busy life. The annexe is very prettily furnished, very clean,well equipped, quiet and warm which was essential as the weather was very cold. It is very well situated for site seeing in Dorset and Somerset and near to beautiful beaches. Marianna the owner was delightful. Thank you so much for a lovely weekend. We had a lovely time here, very quiet and peaceful. Marianna was really nice and helpful. Very well presented throughout. Definitely worth a visit. We had a nice short break there. We went to a Christmas Fayre, had a nice walk along the beach and went to Lyme Regis. All in easy reach! The property was ideal set away but near places should you wish to explore. It is decorated and maintained to a high standard and Marianna was warm and welcoming. The garden is impressive and a little sun trap on the patio even in October. Would recommend and stay again. We are in a small hamlet in the beautiful Marshwood Vale, surrounded by green fields and only a 15 minute drive from the coast. Perfect for walking holidays, exploring the Jurassic Coast or simply getting away from it all. There are so many things to do close by including restaurants, cafes, country houses and gardens, theatre and cinema and hundreds of beautiful walks. Please do let me know if you would like any particular recommendations for places to visit while you are here as I'm very happy to help you plan your perfect getaway.